Long gone are the days when rogue security and optimization tools dominated the computer threat landscape. These pests gave in to more sophisticated culprits like ransomware and cryptojackers over time. Yet, this activity based on a combo of malvertising and social engineering continues to maintain its niche in the dark web underground, with programs like Win Speedup 2018 proving this perseverance. What is the Win Speedup 2018 virus? It’s perfectly natural for computer users to care about the health of their machines. A smoothly running system that responds to commands in the blink of an eye is certainly a great thing, which explains why most people treat proper PC performance as one of their top cyber priorities. Threat actors out there know it and keep launching manipulative software campaigns that instill doubt about the stability of host systems. The malicious app called Win Speedup 2018 is one of the widespread instruments used in these despicable hoaxes. 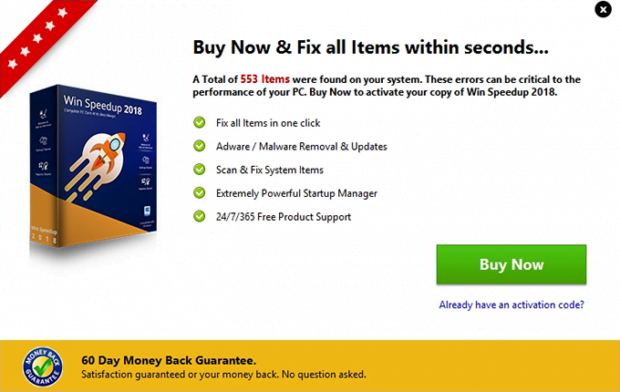 It is marketed as a system utility that keeps a computer fast and error free by means of the registry and startup cleaner modules as well as a built-in browser adware and add-on remover. Normally, this could be a commendable feature set, except that most issues being reported are phony in this case. In other words, Win Speedup 2018 is a fake performance booster that pursues mercantile goals whatever it takes, even by dint of outright deceit and deliberate computer slowdown. One of the ways it infiltrates Windows PCs is through misleading ads that lead to its homepage quickpcupdate.com. Another distribution method is based on bundling – this one prevails over the above-mentioned official promotion tactic. In this scenario, a user catches the baddie when installing some unrelated program, such as a free video downloader, streaming content converter, media player or booby-trapped Flash update. Those who go headlong through these multi-component setups run the risk of unwittingly authorizing the rogue item to enter their systems. 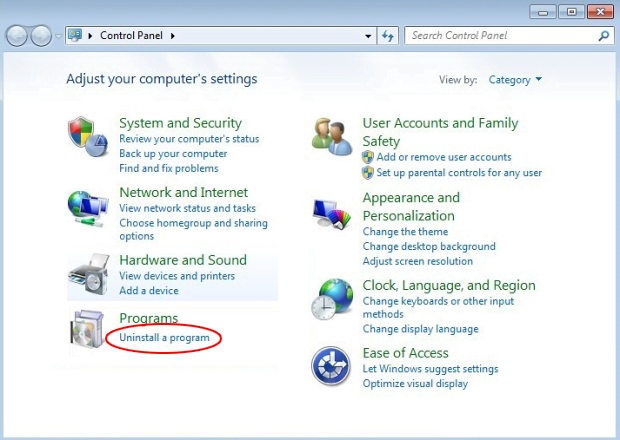 The catch is in the default installation mode, which is what most users never opt out of. Instead, it’s recommended to select the Custom option, because it allows viewing all the entities under the same umbrella and deselecting the unwanted ones. Win Speedup 2018 starts manifesting itself inside a host computer as soon as the surreptitious intrusion has taken place. It plays its “trump card” from the get-go by displaying a counterfeit system scan. The scan report looks fairly spooky as it lists hundreds of performance issues that aren’t there for real. Most of these pseudo bugs are categorized as “system/user software related”. Next to each area being purportedly scanned, the misbehaving program provides a visual improvement potential scale, which is going to be labeled “High” even for a brand new PC. That’s a trick to additionally pressure the victim into wanting to fix the problems. Also, once the bogus computer checkup has been completed, the perpetrating app will generate an audio warning that urges the user further to sort things out. Every attempt to click on the X button and exit Win Speedup 2018 interface will bring up a popup window that emphasizes the huge number of issues supposedly detected on the computer and says these errors can be critical to the performance of the PC. That’s actually a purchase prompt that instructs the victim to proceed to a payment page and activate the application’s licensed version for a registration fee. Doing so is a bad idea, because the self-proclaimed optimization tool has made up most of those issues in the first place, not to mention that it’s the only real threat. So, be sure to remove Win Speedup 2018 before it moves on to the next phase of the attack and deteriorates the system to an appreciable extent. 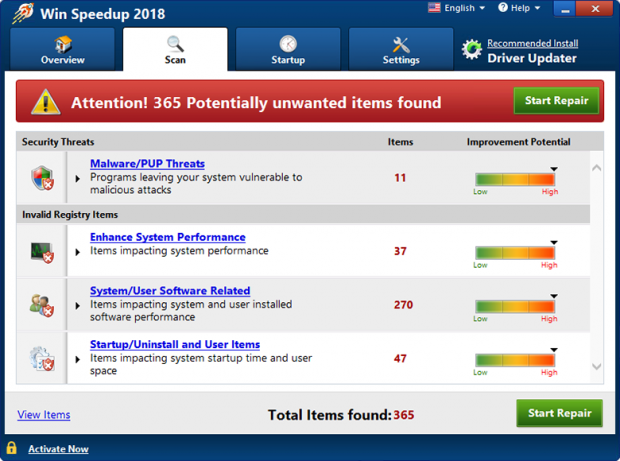 The extermination of Win Speedup 2018 can be efficiently accomplished with reliable security software. Sticking to the automatic cleanup technique ensures that all components of the infection get thoroughly wiped out from your system. 2. The scan will come up with a list of detected items. Click Fix Threats to get the scareware removed from your system. Completing this phase of the cleanup process is most likely to lead to complete eradication of the infection, so you can move on with your day malware-free.